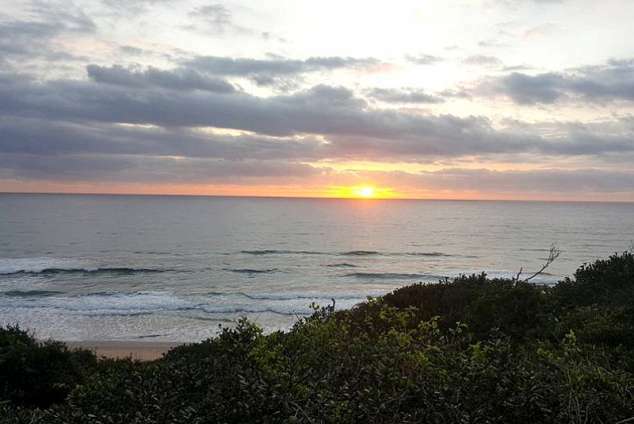 Dream Beach Self Catering Lodge - Ponta Do Ouro Accommodation. Dream Beach Self Catering Lodge offers luxury holiday resort comprising of houses and chalets set in a tranquil dune forest between Ponta D'Ora and Ponta Malongane in southern Mozambique. With easy access to a secluded beach, the houses all have sea views and share a wooden walkway to the beach. Houses sleep six persons each in three bedrooms with three bathrooms. The chalets look inland and are about 300m from the beach via a contoured path. Chalets are all en-suite and share a communal kitchen and dinning room. The deluxe chalets have a private kitchen. There are ten standard chalets and five deluxe chalets with private kitchenette built in the gardens around the pool. The only real difference between standard and deluxe is the kitchenette. All chalets have a ceiling fan. There is a communal kitchen with a very nice dinning room. There is also a communal braai area between pool and dinning room/kitchen. There are two small charcoal braais just right for two people. 4 sleeper cottage. Two en-suite bedrooms with air-conditioning. One bedroom with double bed other with two singles that can be made up as a king size on request. Private open plan lounge/kitchen. TV and DSTV dish on compact package. Not equipped for Explorer. Kitchen fully equipped with gas stove and electric oven, decent size fridge with freezer, microwave, kettle, toaster, cutlery and crockery and utensils. Bring your own beach/pool towels. Privately owned four sleeper with 4 extra length single beds that can also be made up as a king-size beds. Two en-suite, air-conditioned bedrooms with private open plan kitchen/lounge, braai and covered deck. Kitchen fully equipped with cutlery, crockery, utensils, pots and pans, gas stove with electric oven, microwave, kettle, toaster and decent size fridge. Equipped with TV and dish for open view. The largest of our four sleepers. This unit is privately owned by family with two small children and has two air-conditioned en-suite bedrooms with a large open plan lounge/kitchen/dinning area. Kitchen fully equipped with gas stove, kettle, toaster, microwave, decent size fridge with freezer sufficient for a family of four for a week. All cutlery, crockery, pots and pans supplied. Bring your own beach/pool towels. TV with DSTV dish, but please bring your own std or pvr decoder. Not compatible with Explorer. Privately owned. Best suited for a family with small children who can share a bedroom with parents. Sleeps four in two single beds and a double bed behind a screen in a large air-conditioned room. En-suite bathroom, private kitchen and deck close to swimming pool. Kitchen has a two plate gas hob with kettle toaster and microwave with a decent size fridge with freezer section. All cutlery, crockery, pots and pans supplied. Please bring your own beach/pool towels. There is no TV. Six sleeper owners home when in residence. In the front row with short (steep) walk to the beach. All bedrooms have two single beds that can also be made up as a king-size bed. Fully equipped kitchen with washing machine, dishwasher, gas hob with electric oven, microwave, kettle, toaster, pots, pan & baking tins, cutlery and crockery. Outside charcoal braai and gas braai on deck. Parking for one car under the house. Two air-conditioned en-suite master bedrooms. Third bedroom has private bathroom across the passage. 3G WIFI modem (84 760 3818) in house. Purchase Vodacom airtime and arrange with Enoque to convert it to data for you. House equipped with TV and DSTV on basic package. Can take std and pvr decoders. Not equipped for Explora. This wheel chair friendly house sleeps six people. There are two air-conditioned en-suite master bedrooms. The third bedroom has a bathroom across the passage. One of the master bedrooms has a double bed and the other two rooms have two single beds each that also be made up a king-size bed on request. The house has lots of parking and has a flat screen TV with compact DSTV package. Bring your own decoder for more channels. Not equipped for Explora decoders. The kitchen has an electric stove, microwave, toaster, kettle and fridge with freezer section. The house has (poor) 3G wifi. Just buy local data for 84 272 6678 or ask Enoque to help you. Rates are about R100 for 5Gigs of data. 4896 page views since 05 Feb, 2018. Last updated on 27 Feb, 2018.